Our Super Bowl hopes were dashed as our home team, the Denver Broncos, lost in the playoffs. To comfort ourselves, we intend on throwing a Super Bowl party with lots of carbs—Italian style! We’ll be ordering ours from our new favorite Italian spot. We enjoy hobnobbing with internationally recognized personalities in the food and wine industry and the adventure of traveling abroad. Our true delight, however, is sharing local venues with our friends and family, the kind of places where we are greeted with smiles and light, happy conversation. Restaurants that value our connection to the earth and to each other. Vintners who are proud to present their knowledge, patience and skill through their gifts of wine. Friendly faces who deem eye contact and laughter as valuable as sales. We’ve discovered a true gem of a restaurant that does all of these things: Colorado’s Apeizza e Vino. Founder Rich Foresta’s passion for creating delicious Italian cuisine starts in the kitchen and ends on the dinner table. New Yorkers know their pizza and Rich, a native of the Big Apple, has been rolling in the dough ever since his youth. He opened his first restaurant in 1992 in Pueblo, Colo. and called it Angelo’s Pizza Parlor. He is now the proud owner of three pizza/wine bar establishments within the state and a fourth opening soon. Apeizza e Vinois the name of his latest store and is now available as a franchise opportunity. Rich is intent on sharing his Italian heirloom recipes. With a tastefully appointed wine bar and a lovely ambiance of low lighting and smooth jazz music, the environment of Apiezza e Vino is inviting. 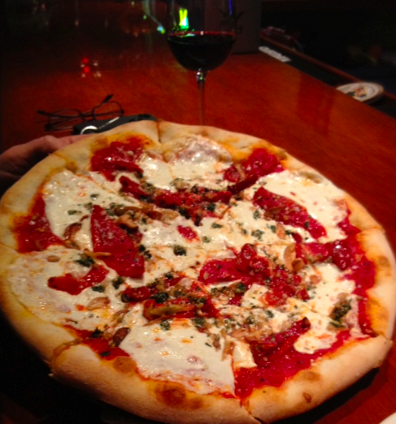 The rustic brick wood-fired oven incites the senses with the smell of fresh garlic and sweet basil. Rich uses locally grown “Isabelle Farm” products. At our most recent visit to the restaurant, our chosen entrée was the Torta Al Pesto pizza topped with basil pesto, roasted garlic, imported cured tomatoes, hot Italian peppers, with Fior di latte mozzarella. 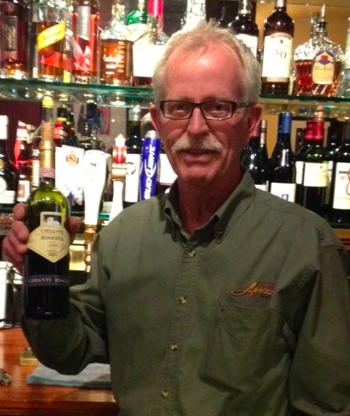 It paired beautifully with the Renzo Mazi Chianti Classic Reserva recommended by Glenn the resident jolly mixologist. Mama mia, was it good! Manager Branka told us Rich loves the environment in more ways than one. He enjoys cycling and builds single speed bikes for his cooks to promote healthier lifestyles. He seeks to build appreciation of and participation in Italian cuisine among the local community through his online newsletter at www.apeizza.com. It includes the latest stories about what’s happening in the pizza industry and recipes, too. So for our Super Bowl party, we will be preparing his eggplant appetizers. Rich says, “For generations, our family has loved preparing meals for anyone with an appetite.” Pizza and vino, the best combination to start the year out right no matter which team wins! A mixture of three delicious cheeses marks the filling for thin slices of eggplant that are rolled, dipped in flour, breadcrumbs and egg, then fried. Dip each slice in the flour, then in the eggs and finally dredge them in the bread crumbs. Now fry in oil. Delicious! !